As with the the rest of the country, western Bhutan is a collection of valleys. The remote Haa valley in the far is separated from the Paro valley by the 3810m Cheli La. The relatively built-up Thimphu valley to the east is divided from historical centrers of Punakha and Wangdue Phodrang by the 3140m Dochu La. East of here the rugged Black mountain forms an even greater barrier that separates western Bhutan from the rest of the country. This is the region of Bhutan that most tourists see and for good reason. It’s the heartland of the Drukpa people, home to the only airport, the capital and the largest, oldest and most spectacular dzongs in the Kingdom. Whether it’s the beginning of your trip or the all of your trip, it’s a spectacular introduction to a magical land. 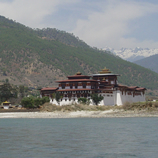 -Visit the spectacular dzongs of Paro, Wangdue Phodrang and Punakha. -Visit Drugyel Dzong, 18 kilometers away from Paro town. On a clear day one can view the sacred Mount Chhomolhari, Mountain of Goddess (24,000 ft). Visit a typical Bhutanese farmhouse and sightseeing trip to the Paro Bazaar. Visit also Ta Dzong that houses the National Museum. -Visit Simtokha Dzong the oldest fortress in Bhutan built in the 17th century by Shabdrung Ngawang Namgyal, the unifier of Bhutan. 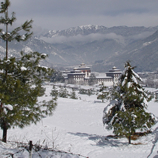 -Immerse yourself in Bhutanese culture and history at Paro’s national Museum. -Spot black-naked cranes or just do some great hiking in The remote Phobjikha valley. -Hike uphill to the dramatic cliff-hanging Tiger’s Nest, Bhutan’s most famous sight. -Be blessed with a 10-inch pallus, if only for a day, at Chimmi Lhakhang, the monastery of Divine Madman. Day 08: Punakha to Paro.